Volkswagen unveiled its new convertible coup-ay, the Eos, this morning, to a near insatiable crowd (see below) of sharp-elbowed auto reporters. The retractible hardtop is pretty slick, with more angles than the pattern on Charlie Brown's shirt. The glass/sliding/tilting roof, the company says, lets in light, air and good humour (honest to god). 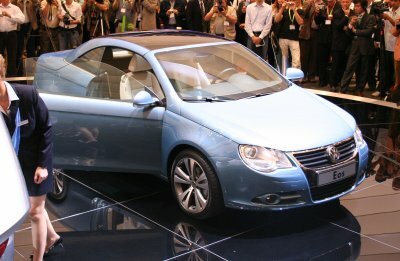 The single-version Eos — which will get a range of engines, including a TDI diesel, on up to a 250hp V6 — will launch in Europe in spring 2006, with "the other continents" coming later the same year. The pictures are courtesy of our Frankurt partners in crime, the boys of Autoblog.it.